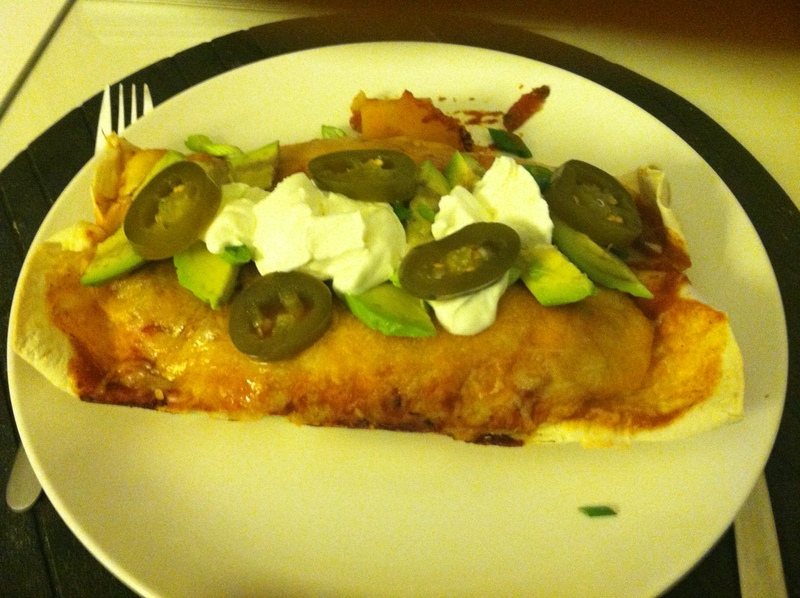 Last night we had some butternut squash and black bean enchiladas for dinner. I also had black beans for lunch. I think I’m going through a phase. 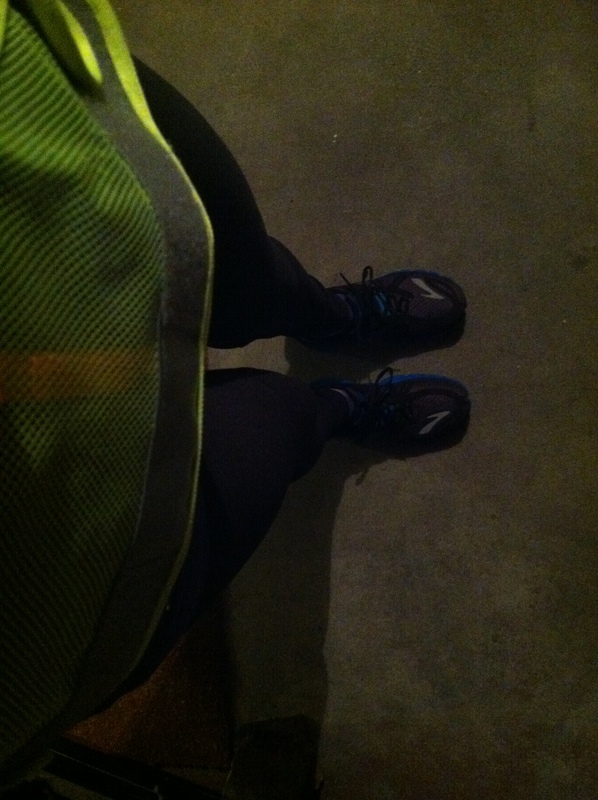 These last two weeks have involved running in the dark. But at least I have my super attractive running vest. This morning was a tempo run. First mile at 8.30 ish min/mile pace, followed by 2.5 miles at 7.15 min/mile pace and then a slow mile home. It actually felt surprisingly OK. Still hard but a couple of weeks ago I was really struggling to maintain this pace and now it was at about 80% effort. It seems as if everything is finally coming together. Which is good as my half marathon is exactly one month from today! Yikes. If you read my blog you probably know that I’m all about living a healthy lifestyle. I love to exercise and try to eat as healthy as I can. But I have to confess that there is one area of my life that I seriously neglect – my mouth. 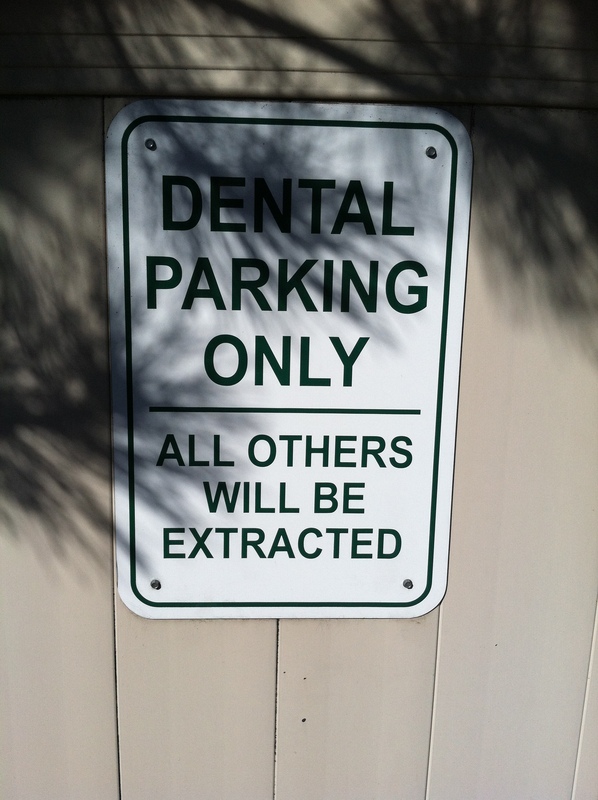 Specifically visiting my dentist. I mean I still brush my teeth all the time – I’m not that gross. 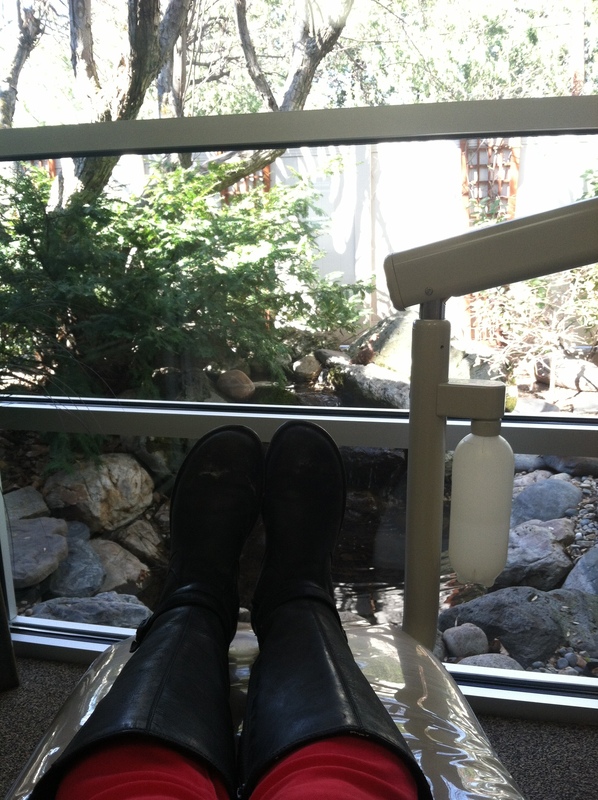 But I have a really strong aversion to the dentist. So after 4 (I know!) years I knew it was long past time to bite the bullet. I made a pact with myself this year to no longer put off things that made me anxious – going to the dentist, filing my taxes, sorting out my visa, planning my wedding………. It went ok. Nowhere near as bad as I had been imagining. And not too much shaming for my lack of visits. Two cavities which I’ll fix next week and a good cleaning. He did mention that I should think about having my wisdom teeth removed and casually said that I would be a good candidate for complete sedation during this procedure. I bet he says that to all his overly-anxious patients. My new goal is to not let anxiety get in the way of my health again! At least they had a pretty Japanese style garden to ponder on during my visit. Last night I continued my quest to eat as much Mexican food as possible. More quesadillas. 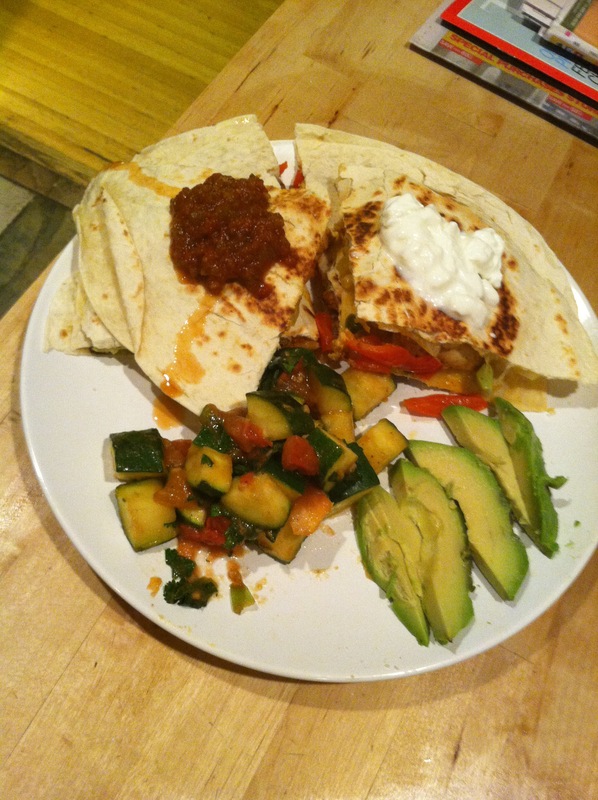 This time with zucchini-tomato-cilantro-green onion and a side of avocado. Yum. I guess I should also mention that although I’ve been referring to J as my boyfriend, technically he is my fiance. We’re not doing the big ring-big wedding thing – after 8.5 years we just want a courthouse and some good food afterward. Friday 12th September 2014 – put it in your diaries. We have been reading through this book thought – I guess to make sure we are on the same page for all of the important life decisions. And so far so good. 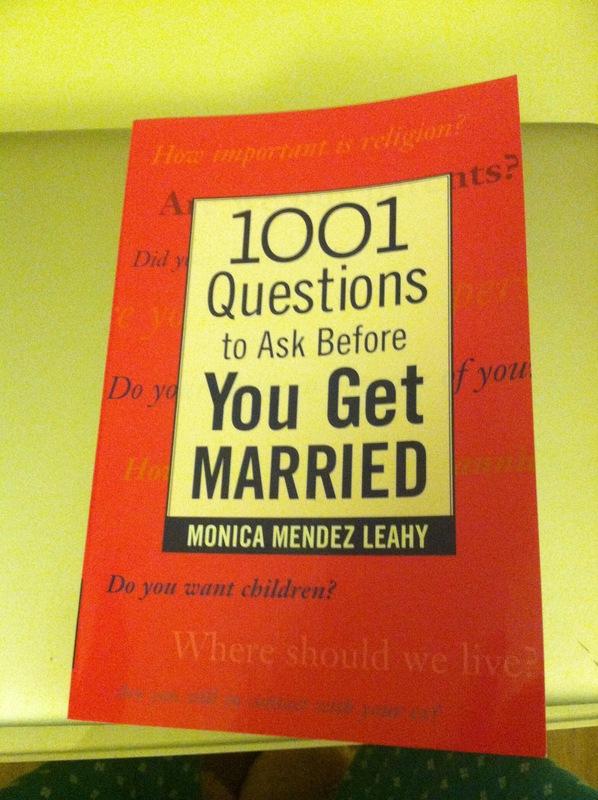 Reading this has made me appreciate our relationship and also helped me understand why the divorce rate is so high. Holy crap some of the questions seriously made my scared for humanity. Example: (In the section on pets – yes she covers everything) Do you hate your partner’s pets and secretly leave windows and doors open so that they will run away? Yikes! What kind of person would do this? How could you be engaged to someone and planning to spend your life together without checking if they are a crazy person? Mind-blowing! Back to training. Today is Day 10 and luckily the sidewalks were clear after yesterday’s snow. I decided to run to the local park and see how a tempo run would feel. 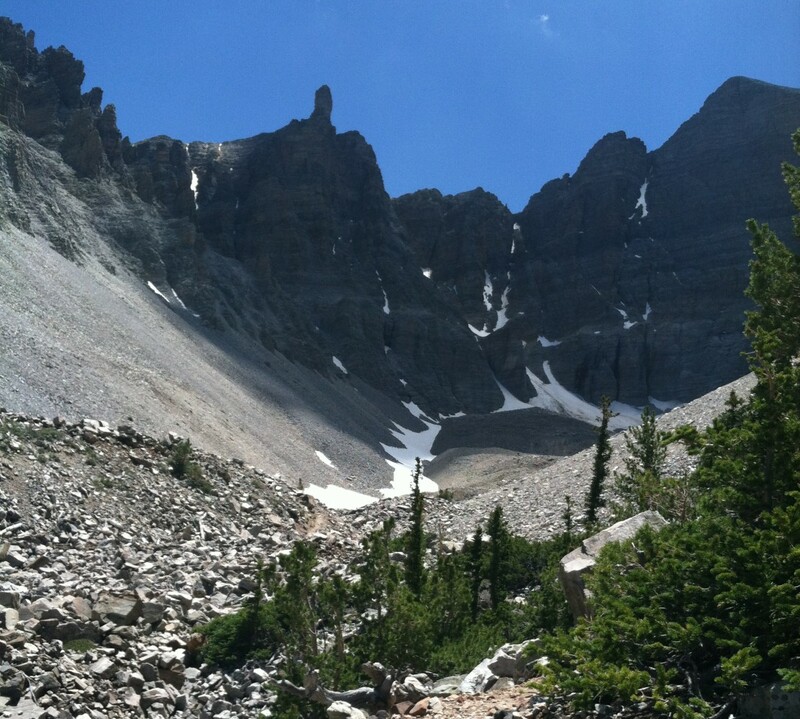 I wanted to take it easy and check everything out and make sure that I was pain free. I did a 10 min warm up followed by 10 min at 10 K pace and a 10 min cool down. No pain! Felt good – only took about a mile for my face and fingers to warm up. The tempo section felt comfortably hard, although I felt if I pushed it I could’ve gone faster or further. This is my fastest mile since August 2013! One of my goals this year is to break 7.00 min for a mile. Very happy. Now I just have to add time to the tempo section and see what I can do. Before work I headed to the PT for a follow up from last week. 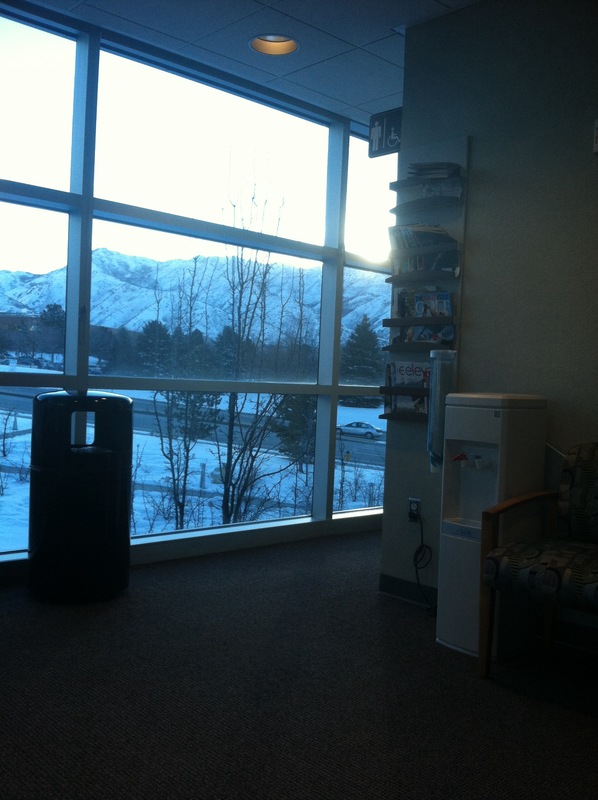 At least they have a pretty view from the waiting area. The session started with a “massage”. Oh my God it hurt so bad. This time they used special metal devices (relics of the Spanish inquisition I believe). Then I got another set of exercises and stretches to add to my collection. My glutes are still weak and my left side is still way worse than my right. My running form is a little improved but still have to work on my form. No touching knees. Tuck my pelvis. Stand tall. Elbows in. Next time we’ll also try and make my landing more midfoot and less heel. It was a lot to take in but my PT high-fived me on the way out and said I can still run so I’m counting it as a win. More next week. Plus he was wearing a pair of Altras so I knew if was legit!